Our Stewards~we love, appreciate, and thank you! As we live out Catholic Social Teaching we do so in obedience and faithfulness to the Catholic Church. To find out what American Catholic Bishops are proposing and teaching, check out the USCCB (link). CAST is a 15 yr old ministry that provides simple meals, as well as personal hygiene items, warm socks, hats, shower passes and tarps to Bellingham’s less fortunate. CAST operates Monday through Thursday, year round. This is a shared ministry with other faith communities through Interfaith Coalition. Our Newman Center students & Sacred Heart parishioners cover each Monday throughout the year; the Newman Center during the school year and Sacred Heart parishioners during school breaks. This outreach ministry not only meets the physical needs of those it serves but also offers the opportunity to show the love of Christ to those who are experiencing great suffering. Sometimes it’s just a warm smile that says, I care about you…..Because there are not only physical needs, but also the need to be seen, respected and understood. Would you like to share in this vital ministry…? We need Sandwich makers, drivers and servers. We begin at 4:30 pm each Monday making sandwiches and packing up the other items at St. John’s Lutheran, 2530 Cornwall Ave. We then transport items to the Opportunity Council, 1111 Cornwall Ave., where we set up our tables in the parking lot and serve from 6:00-7:00. Afterwards, drivers return containers & tables back to St. John’s. You can sign up for just one part or start to finish. This is an excellent way to express your gratitude to God for all the blessings in your lives by bringing a little support to those not as fortunate and by getting to know them as people, individuals who have the dignity of being made in the image and likeness of God. Blessed be the God and Father of our Lord Jesus Christ, the Father of compassion and God of all encouragement, who encourages us in our every affliction, so that we may be able to encourage those who are in any affliction with encouragement with which we ourselves are encouraged by God. For as Christ's sufferings overflow to us, so through Christ does our encouragement also overflow. If we are afflicted, it is for your encouragement, which enables you to endure the same sufferings that we suffer. Our hope for you is firm, for we know that as you share in the sufferings, you also share in the encouragement. JustFaith offers an opportunity for people to experience a spiritual journey that opens the door to experiences of personal transformation and a conversion of heart and mind that help us learn how to live as faithful disciples of Jesus, to be agents of his compassion and healing in a wounded world scarred by the domestic and global crisis called poverty. Over 30 weeks, participants gather weekly for prayer, discussion of books and videos, presentations by guest speakers, retreats, and immersion experiences. JustFaith fosters the chance to form a missionary heart. Pax Christi is a group that meets monthly for prayer and discussion around themes of Peace and Justice. The monthly meets are held the first Tuesday of each month at 7:00 p.m. at Assumption's Pastoral Center. The theme for last year was Reconciliation. Stay tuned for next year's theme! This is a wonderful, small, faith group with a specific focus and which requires a minimum investment of time. All are welcome! 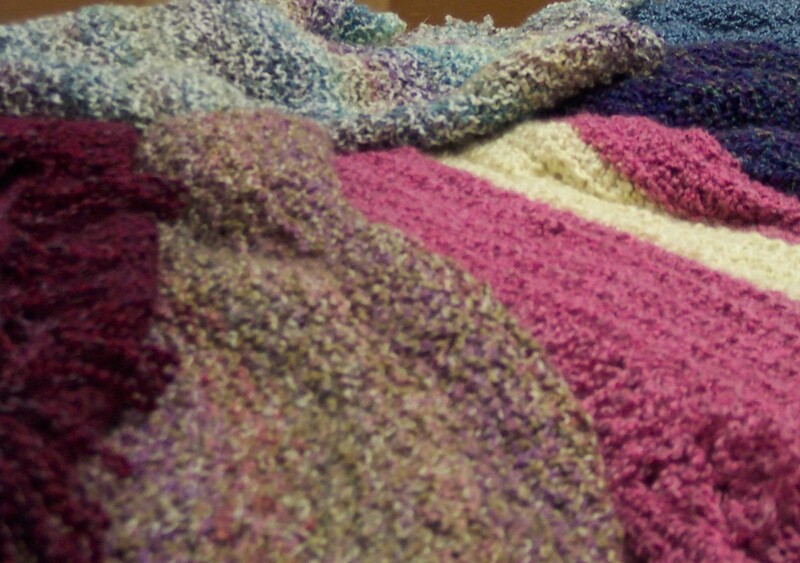 A parish group that meets weekly to knit shawls for those who are sick or in need of prayer or comfort. Thanks to the knitters and with the support of YOU the parishioners, the prayer shawl ministry is still going strong at Sacred Heart. We accept financial donations at any time during the year, to purchase a particular type of yarn. We are grateful for them as are the recipients of the prayer shawls. You may drop off your donations at the Parish Office or give such donations to any of the knitters. Please help us continue this meaningful support for those in need. If you or someone you know is in need of a prayer shawl please contact anyone at the Parish Office and the message will be passed on to the Health Ministry Team. Size 11 or 13 needles with 3 skeins Lions Brand Homespun yarn. (you may use any type of bulky washable yarn that you wish). Cast on 57 stitches, Knit 3, Purl 3. Begin and end each row with K3. Starting with the second row knit over the previous purl stitches, purl over the previous knit stitches. Continue this with each row. One prayer you might say is Father, Son and Holy Spirit with each of these three stitch combinations. You can choose to knit (garter stitch) the whole shawl, however, it is much looser and can become quite large with stretching. You may add fringe (any length) to both ends. Always knot the end of the fringe as this brand of yarn frays. Very Important: Please attach your name to the shawl you made. We need this information for our records and recipients often want to know. You may drop off completed shawls at the Parish Office. Each year on the anniversary date of the Roe v. Wade decision citizens of Washington State gather in Olympia for Mass and for a March to the Capital in support of Life. Please plan now to attend. Your presence, in growing numbers every year, is the best way to draw attention to the untenable legacy of Roe v. Wade, and to persuade our leaders to eradicate it from America’s future. Click here for information on the Washington State march. Click here for information on the national march in Washington D.C. Check out these pro-life movies! Sacred Heart Parish is a Roman Catholic Parish and part of the Archdiocese of Seattle.